Home > Big Data•Data > Big Data: What is it and Why does it Matter? The answer to the first question isn’t fixed – it would’ve changed by the time you’d have completed reading this line. For all we know, by the time you’ve read through the article, the total amount of data in the world would have soared by quite a bit. According to IBM, we create roughly 2.5 quintillion bytes of data per day – To put things in perspective, that is the capacity you’ll need to hold around 530,000,000 MP3 songs. Look at that number again, there are quite a lot of zeros in there. Now, let’s talk about the “what”. What data is this? And that’s what they’re doing. By they, we simply mean the ones who’re in charge of collecting this data. Everything you do on the internet is adding to this colossal mountain of data. Your Facebook posts, Tweets, Snapchat stories, and whatever the kids are using these days – are just bricks in the huge wall of Big Data. So, to answer your second question – the data in question is the very data you’re producing every passing moment. Every time you book a cab, or order food online, or even do a very basic google search – It’s all going on top of the heap. Everything is being collected. That’s what is making this big data, bigger – every passing minute. Now that you’re in control of the situation, let’s dive a little deeper into the ocean of Big Data. Further, we’ll look at why exactly does Big Data matter so much, and who’re the ones benefiting from it? According to the data scientists at IBM, Big Data can typically be characterized by 4 V’s – Volume, Variety, Velocity, and Veracity. Very simply, volume means how “big” the Big Data is. Like we said earlier, there’s no specific number to it, it’s ever-increasing. The data we’re talking about comes from a number of sources, hence it is in numerous formats. We’re talking about data in the form of audio, video, pdf, email, and more! Most of this data is unstructured – implying not much sense can be made out of it without a proper study. The flow of Big Data from the variety of sources we discussed above is massive and un-ending. Like we said, by the time you’ve read this article, the amount of Big Data in the world would have increased drastically. If you don’t believe us, listen to the guys at IBM who claim that by 2020, there’ll be 5,200 GB of data for each and every person on Earth. Yeah, talk about velocity! Veracity in context of Big Data simply refers to the noises and anomalies present in the data. 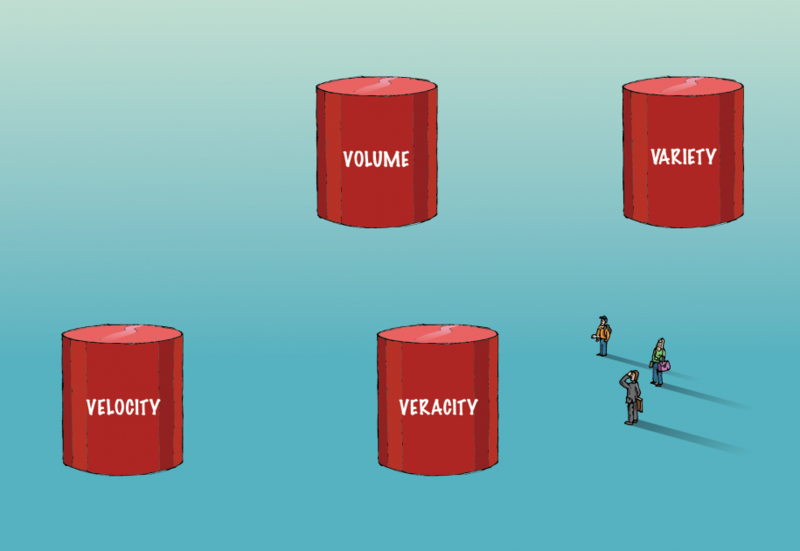 When dealing with Big Data, veracity is one of the biggest challenges that data analysts face. Know all about the backbone of Aadhaar: Big Data! By now, it’s clear that there’s a lot of data around us, almost too much to even think about! Making sense of this data is quite a daunting task in itself. For this, we have data analysts – the heart and soul of any organization’s analytics team – but how exactly do businesses use data to power their operations? Let’s see. Big Data matters – but why? The organizations which earlier had to rely on the data collected through archaic spreadsheets now have access to tonnes of data on their customers. Data that can be used to overhaul their business and make profits like never before. And today, businesses HAVE data – a lot of it. But how exactly does it help them? It gives the organizations the power to know the real-time feedback of their consumers. The days of polls or surveys are long gone – sentiment analysis provides much more comprehensive and actionable feedback. Tools like HootSuite, TweetReach, Klout, and BuzzSumo are just a few examples of social listening tools that help the organizations stay a step ahead by knowing what the consumers have to say, their sentiments, and feedback. Thanks to Big Data, organizations can now compare their products, services, and overall brand image with their competitors by examining user-behavior metrics in real-time. This helps organizations in promoting new products and services to the target audience in a much more informed and innovative way. There are various sophisticated tools dedicated to Marketing Analytics which help organizations keep a close eye on how their product is being received in the market. Some common tools for this include – Marketing Evolution, Predictive Modeling, Lattice Engines – all of which aim to improve the organization’s ROI by leveraging Big Data. Using this stream of Big Data analytics, organizations can dive into social media activity on any subject, based on a variety of sources, all in real-time. For example, let’s say you want to target specific customer groups and provide them with exclusive special offers – you can do that now, using Big Data. It’s a win-win situation for both the organization as well as the customers. The same tools as the ones discussed in Social Listening can be used for this purpose as well. Organizations can boost customer engagement manifold by analyzing Big Data from a multitude of sources. Also, using these metrics, they’re able to figure out, and eventually iron out any potential customer issues that might go viral – preserving brand loyalty and improving customer service, at the same time. It’s safe to say that no domain of business today is untouched by the magic that is Big Data. From banking, to healthcare, to social-media, to education, to even government sectors – the list can go on – everyone is trying their best to make sense of the data at hand and outperform their competition. Asia’s largest healthcare group – Apollo hospitals – is using Big Data and analytics to control HAI (hospital-acquired infections). Big data is used quite extensively to improve higher education. Take the example of the University of Tasmania. It has deployed a management system that tracks things like the time at which a student logs on to the system, time spent on different pages of the system, and even the overall progress of the student. Big Data has a wide range of applications in government operations and services. They include energy exploration, fraud detection, environmental protection, financial analysis, and health-related research. We can go on and on about each and every industry, but we think you get the gist. Big Data analytics is being used wherever it is possible. And frankly, there’s no domain that can’t use a little data analytics to improve their operations. Because at the end of the day, data is all that’s there, and all there will ever be. 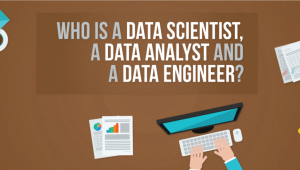 Big Data Career – All the Skills, Roles; Transition Tactics Defined! It’s safe to say that Big Data is not just a fad – it’s a revolution. It’s always better to stay on your toes when you’re in the middle of a revolution, or you’ll be left behind before you know it. What makes one particular organization stand out from the rest is the way they deal with their data. Having said that, it’s only fair to conclude by saying that the demand for good data scientists is, and will keep on, increasing. So, buckle up while you can, and get started with exploring the mad but genius world of Big Data!